Due to the importance for both teams and the impact on further development, you’ll find a Polish version of this text below. Ze względu na duże znaczenie dla obu zespołów i wpływ na dalszy rozwój, polska wersja tego tekstu znajduje się niżej. One and a half years ago, we announced that Poland Rebuilding joined our team. The main goal was to achieve better coordination between the developments in Poland and the rest of Europe. We joined forces; tried to be ever greater than we ever could be alone. And at first, this was the case, as ProMods 2.0 had proven to be a turning point in ProMods’ future developments and quality standards. Over the last 6 months the cooperation between ourselves and the PR team, led by Radol, became increasingly tense when we pointed out possible improvements to old techniques used in their area of development. Attempting to follow closely in the footsteps of SCS, we always ensure that we are using the latest standards and features of the map editor to give ProMods its distinct look and feel, rivalling the official SCS DLCs. 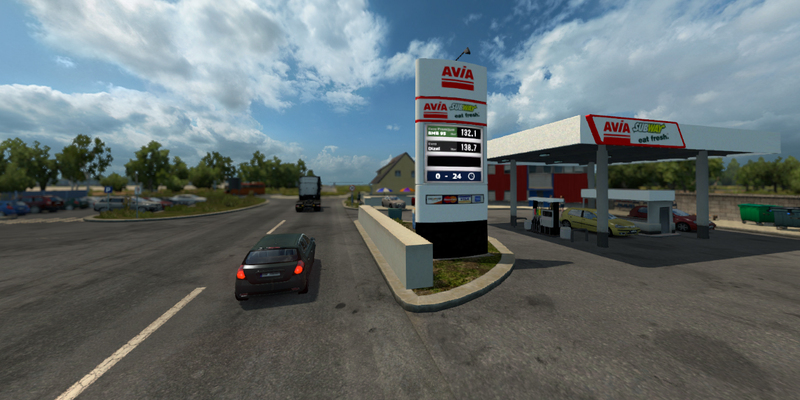 Features such as road templating and editable signs have allowed us to build countries much closer to their real life equivalent than was previously possible in a video game. The stance of the PR team was to “mind our own business”, not spend too much time on these details and “keep out of the Polish territory”. And it was this isolationist stance that was a large contributor to all the tension between the two teams. Another hurdle was the addition of very dense areas in parts of the Polish territory, in recent work there were over 100 companies spread across just 3 cities, creating a very dense area that was disturbing the balance in the freight market, generating many more jobs going to and from Poland compared to any other country in Europe. This directly clashed with our views of a comprehensive and balanced European map. Another, but less important issue was that their areas contain a lot of sloppy work in terms of finishing and polishing. Hard, unnatural texture transitions, mixing grass textures, small holes and so forth. Furthermore, the latest techniques like sign templates, country specific prefabs and road templates – which are a hallmark of our map mod and are details that make ProMods the mod it is today – weren’t used; they didn’t want to change their aged methods and techniques, because “things always worked well this way.” Even if there were better or more elegant methods to achieve the same goal. Some of our Polish fans seem to think that we do not respect the work that has been delivered by the PR team. This can’t be further from the truth. We fully appreciate the contributions that PR have made to the wider ProMods project but at the same time there were irreconcilable creative differences, such as those described in this post. We also specifically want to highlight the talent that reflects on the Polish map makers working for Radol, not usually credited elsewhere, that have also become victims of this situation. Radol demanded exclusive ownership of the Polish sectors on the map which frequently lead to development problems when we had to update certain assets all over the map. It also created conflict in the border zones with other countries such as Germany, Lithuania and Russia (not to mention the Czech Republic and Slovakia, which we haven’t even started to rebuild on a large scale). Although the two branches of the team worked separately, we all use the same shared file system. This system relies on a procedure of frequent updates by all its users to minimise the amount of conflicts. Other developers can take over areas where one developer left off, which actually can be very beneficial if you consider that since we are spread over multiple times zones, one person can work on the same area another person worked on earlier while they sleep. “Taking turns” can speed up development significantly. For this to work, map sectors often only get occupied for a few hours, or a fews days at most, and clear communication about who is working where and when is essential. The PR team demanded their map parts to be locked almost indefinitely with very little communication. This makes the aforementioned method of working practically impossible. Although in principle intense communication would have solved the problem, the lack of communication also played a huge part in the partnership breaking down. 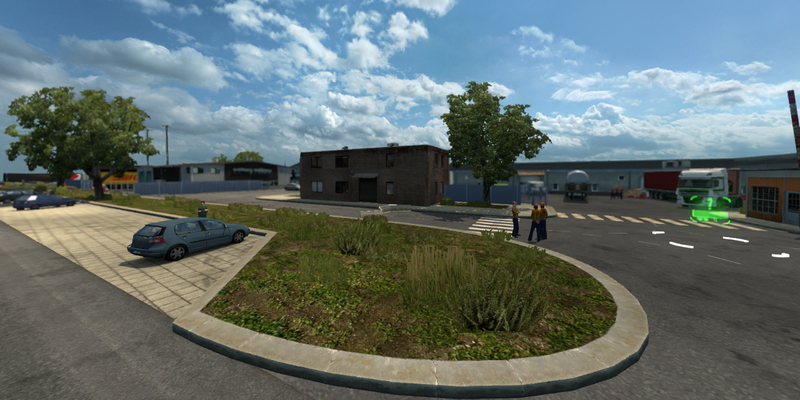 ProMods relies on frequent daily interaction between all of the members of the team. Many of us spend hours talking to each other every day. Yet the Polish team isolated themselves in a local chat service which was not accessible to the rest of the team. Moreover, even their public channels were silent, showing very little progress to the community on our forums or social media. This can partially be explained by the language barrier – which was greater for some members of their team than others – but also by a lack of willingness to become part of a greater group. In hindsight it looks like the PR team never had the intention to melt into – and become – ProMods, rather remaining independent as a separate development branch. From ProMods’ perspective, we intended a full integration of the Polish team, which in reality never went further than simply integrating their product: the map and assets. The lack of communication also introduced another problem: our lead developer MandelSoft, who’s responsible for the assembly and distribution of the beta releases, had no insight on what had changed in Poland, which made it a development blindspot for ProMods. This lead to several bugs and sparsely tested areas, simply because it came as a complete surprise that some areas where modified in the stable version of the mod (i.e. 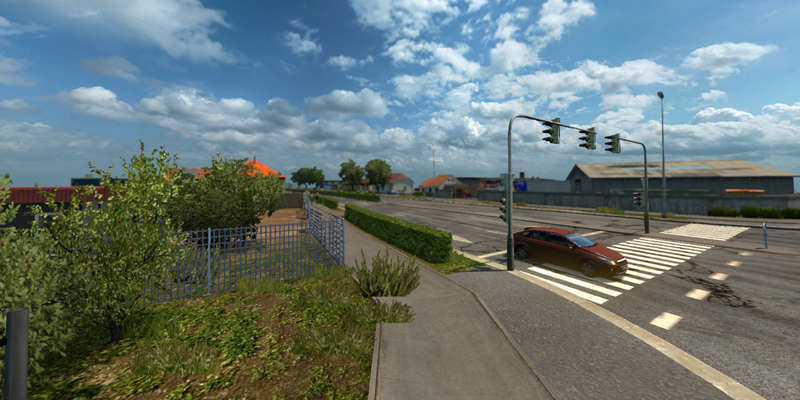 Koszalin was a complete surprise during the development of ProMods 2.10). In this situation, the ProMods team became responsible for some changes they didn’t even know occurred, in a process where this is of the utmost importance to assure stability. This is one of the reasons why the ProMods team attempted to integrate the communication channels. However, this in turn also tightened up the approval procedure to publish new map parts in the beta version, which did upset the PR team. The lack of communication and isolation were the core of the problem. The effects of these problems remained hidden most of the time. As tension was building, a situation had to occur where the problems could no longer be ignored. This is where one of the most iconic projects of the PR team comes in: the Tri-City area. This is the area around Gdańsk and Gdynia, which the PR team completely rebuilt from the ground up. At first glance, what the community has seen so far, it looks amazing and incredibly detailed, like nothing else in the game. And we can’t deny that this was our first reaction too. The real problem began to occur when we started to inspect it more thoroughly. The whole area has an extreme amount of companies. Most cities in Euro Truck Simulator have 5 to 10 companies. A few have more, but those are rare. But the Tri-City area was a whole different beast: the area contained about 100(!) companies. This is more than the whole of Germany, France or Scandinavia. Even within Poland itself it was completely out of any proportions. The effect of such a large number of companies was that it would completely skew the job market to this area, which our tests showed out that this was exactly what was happening. So we shared our concerns and suggested to reduce the number of companies in this area. Our suggestions were interpreted as demands and completely denied by the PR team, even after we offered to make a compromise to reduce to the already high amount of 30. Again, according to them, we “should keep out of Poland”. But this was not just about Poland; the imbalance of the job market concerned us all, as it affected the entire map, not just Poland. But for most of the time, we only heard Radol’s point of view on the whole issue, and we couldn’t speak to any of his mappers. It was very frustrating that all communication had to go through one person, while we would like to speak to the responsible mapper directly about the issue. But the fact that the issue was stubbornly rejected time and time again, despite the fact that the rest of the team agreed that something had to be done to reduce the number of companies, was not doing any good to team relations. Sooner or later this had to escalate to the point where we are now. The key of the breakdown lies within the issues raised in the aforementioned paragraphs: creative differences, communication and isolation. The build-up of tension triggered the collision that occurred last week. We have tried for several months to achieve a closer alignment of our goals. We helped the PR team by creating many new assets such as lamp posts, road templates and prefabs. We gave them all the tools they needed to get to the next level, sadly all in vain. In the past week, Radol placed an ultimatum with terms that were non-negotiable for us as ProMods and he threatened to abandon the cooperation. After a quick opinion poll around the team we unanimously decided it was for the greater good to indeed, terminate the relationship. The decision to each go our separate ways was mutual, however; Radol decided to resign on behalf of the entire PR team to leave ProMods. So, the obvious question is: what will happen to Poland now? We will continue to work on it, but this has to be done by different people in our team. While we can apply our style of working to this part of the map now, we have to divert the man-power from elsewhere. But rest assured, development will continue, with or without Poland Rebuilding. We do have some locals from Poland in our team and they will help the rest of the team to keep the look of the country authentic. You can follow the continued development of our version of Poland in our forum as usual. Out of respect for the work of the PR team, we will not distribute any of their unreleased developments without their explicit permission. As such, future releases of ProMods will largely be based on the state that Poland was in, as the last mutually agreed release, version 2.15. As far as we have heard from other sources, the PR team will also continue their work in Poland and release it as a separate mod (like it was before our joint venture). The risk of incompatibilities or inconsistencies are on their side now. But we don’t block any map mod from being compatible with ProMods: RusMap is a good example of that. We congratulate our Polish fans for being supportive to us, we know there is a large number of you and we intend to deliver the best possible version of Poland we can in our future releases. We would like to thank Radol and his team for their contribution over time and wish them the best of luck with their future endeavours. Półtora roku temu ogłosiliśmy że projekt Poland Rebuilding dołączył do naszego zespołu. Głównym celem było osiągnięcie lepszej koordynacji prac w Polsce i reszcie Europy. Połączyliśmy siły, starając się osiągnąć znacznie więcej niż moglibyśmy w pojedynkę. Z początku tak właśnie było, gdy ProMods 2.0 stało się punktem zwrotnym dla przyszłego rozwoju i standardów jakości. W ciągu ostatnich sześciu miesięcy, współpraca pomiędzy nami a zespołem PR, prowadzonym przez Radola, stawała się coraz bardziej napięta, gdy wskazywaliśmy możliwe usprawnienia dla starych metod pracy użytych na terenach przez nich rozwijanych. Starając się wiernie podążać śladami SCS, zawsze upewniamy się że używamy najnowszych standardów i możliwości edytora map, by nadać mapie ProMods wyrazisty wygląd i wrażenia, rywalizujące z oficjalnymi DLC SCSu. Możliwości takie jak szablony dróg i edytowalne znaki pozwoliły nam odwzorować państwa znacznie bliższe ich rzeczywistym odpowiednikom niż było to wcześniej możliwe w grze wideo. Postawa zespołu PR to “zajmijcie się swoimi sprawami”, nie poświęcanie zbyt dużej ilości czasu na te detale i “trzymajcie się z dala od Polski”. I to właśnie ta izolacjonistyczna postawa była sporym wkładem w całe napięcie pomiędzy dwoma zespołami. Inną przeszkodą było dodanie bardzo gęsto zbudowanych obszarów na terytorium Polski. W najnowszej pracy, na 3 miasta przypadło ponad 100 firm, tworząc bardzo gęsty obszar który zakłócał balans na rynku przesyłek, generując znacznie więcej ofert pracy z i do Polski, w porównaniu do innych państw w Europie. To bezpośrednio starło się z naszą wizją racjonalnej i zbalansowanej mapy Europy. Kolejną, lecz mniej istotną kwestią był fakt, że ich tereny zawierają mnóstwo niechlujnej pracy, w sprawach wykończenia i finalnych szlifów. Nagłe, nienaturalne przejścia tekstur, mieszanie tekstur trawy, małe dziury w terenie i tak dalej. Ponadto, najnowsze techniki, jak szablony znaków, prefaby dedykowane dla konkretnych państw i szablony dróg – które są cechą charakterystyczną naszej mapy i są detalami, które czynią ProMods tym czym dzisiaj jest – nie były używane. Nie chcieli zmienić ich przestarzałych metod i technik pracy, ponieważ “tak zawsze było dobrze.” Nawet jeśli dostępne były lepsze lub bardziej eleganckie metody uzyskania tego samego efektu. Nasi niektórzy polscy fani zdają się myśleć, że nie szanujemy pracy wykonanej przez zespół PR. Bardziej nie można się mylić. W pełni doceniamy wkład, który zespół PR włożył w projekt ProMods ale jednocześnie, były też różnice twórcze nie do pogodzenia, takie jak opisane w tym poście. Chcemy również szczególnie podkreślić talent polskich twórców mapy, pracujących dla Radola, którzy zazwyczaj nie są wymieniani, a także stali się ofiarami tej sytuacji. Radol zażądał wyłącznej własności polskich sektorów mapy, co często prowadziło do problemów w pracach, gdy musieliśmy zaktualizować pewne zasoby na całej mapie. Doprowadziło to także do konfliktów w strefach przygranicznych z innymi państwami, jak Niemcy, Litwa i Rosja (nie wspominając Czech i Słowacji, których nie zaczęliśmy jeszcze przebudowywać na większą skalę). Choć dwie części zespołu pracowały osobno, wszyscy używaliśmy tego samego systemu do dzielenia się plikami. Ten system opiera się na częstych aktualizacjach przez wszystkich użytkowników, by zminimalizować ilość konfliktów. Deweloperzy mogą przejmować obszary pozostawione przez inne osoby, co może być bardzo opłacalne, jeśli weźmie się pod uwagę że jesteśmy rozsiani po wielu strefach czasowych. Jedna osoba może pracować nad tym samym obszarem, co ktoś inny wcześniej, gdy ta druga osoba śpi. Praca “na zmianę” może znacząco przyspieszyć rozwój. Jednak by to działało, sektory mapy często są zajmowane jedynie na kilka godzin, maksymalnie na kilka dni, a przejrzysta komunikacja kto gdzie i kiedy pracuje, jest niezbędna. Zespół PR zażądał by ich część mapy była zablokowana w zasadzie w nieskończoność, ze znikomą ilością komunikacji. To sprawiło, że wspomniana wyżej metoda pracy była praktycznie niemożliwa. Intensywna komunikacja rozwiązałaby problem, a jej brak odegrał także ogromną rolę w upadku partnerstwa. ProMods opiera się na codziennej interakcji między wszystkimi członkami zespołu. Wielu z nas spędza godziny na rozmowie ze sobą każdego dnia. Lecz polski zespół odizolował się, korzystając z lokalnego programu (GG), który nie był dostępny dla reszty zespołu. Co więcej, nawet ich publiczne kanały milczały, pokazując bardzo niewiele postępów społeczności na naszym forum lub w mediach społecznościowych. Może to być częściowo wyjaśnione barierą językową – która była większa dla niektórych członków ich zespołu niż dla innych – ale także brakiem chęci stania się częścią większej grupy. Z perspektywy czasu wygląda to tak, jakby zespół PR nigdy nie miał intencji by złączyć się z ProMods, a raczej pozostać niezależną gałęzią rozwoju. Z perspektywy ProMods, zamiarem była pełna integracja polskiego zespołu, co w rzeczywistości nigdy nie poszło dalej niż po prostu integracja ich produktu: mapy i zasobów. Brak komunikacji stworzył także inny problem: nasz główny deweloper, MandelSoft, który jest odpowiedzialny za budowę i dystrybucję wersji beta, nie miał wglądu w zmiany które zaszły w Polsce, przez co ten obszar był martwą strefą dla ProMods. To doprowadziło do kilku błędów i słabych testów tych terenów, zwyczajnie dlatego że modyfikacja stabilnej wersji moda okazywała się kompletną niespodzianką (przykładowo Koszalin był taką niespodzianką podczas prac nad ProMods 2.10). W tej sytuacji, zespół ProMods stał się odpowiedzialny za pewne zmiany o których nie mieli pojęcia, w procesie gdzie zapewnienie stabilności jest niesamowicie istotne. To jest jeden z powodów, dla których zespół ProMods próbował zintegrować kanały komunikacyjne. Jednak to zaostrzyło także procedurę przyzwolenia na publikację nowych obszarów w wersji beta, co zdenerwowało zespół PR. Brak komunikacji i izolacja były istotą problemu. Efekty tych problemów pozostały ukryte przez większość czasu. Napięcie rosło, a więc musiała nastąpić sytuacja gdy te problemy nie mogły być dłużej ignorowane. Tutaj pojawia się najbardziej znany projekt zespołu PR: obszar Trójmiasta. To teren wokół Gdańska i Gdyni, który zespół PR zbudował zupełnie od nowa. Na pierwszy rzut oka, co społeczność mogła już zobaczyć, wszystko wygląda zdumiewająco i nieprawdopodobnie szczegółowo, jak nic innego w grze. Nie możemy zaprzeczyć, że taka również była nasza pierwsza reakcja. Prawdziwy problem pojawił się, gdy przyjrzeliśmy się temu dokładniej. Cały obszar ma skrajnie wysoką ilość firm. Większość miast w Euro Truck Simulator ma 5 do 10-ciu firm. Kilka miast ma ich więcej ale to rzadkość. Jednak teren Trójmiasta to zupełnie inna historia: ten obszar zawierał około 100(!) firm. To więcej niż całe Niemcy, Francja czy Skandynawia. Nawet w samej Polsce, było to zupełnie nieproporcjonalne. Efekt tak dużej ilości firm mógł całkowicie wypaczyć rynek pracy, a nasze testy pokazały że właśnie tak się działo. Podzieliliśmy się więc naszymi troskami i zasugerowaliśmy zmniejszenie liczby firm na tym obszarze. Nasze sugestie zostały zinterpretowane jako żądania i całkowicie odrzucone przez zespół PR, nawet po tym jak zaoferowaliśmy kompromis by obniżyć tę wartość do, i tak sporej ilości, 30-stu firm. Ponownie, według nich, powinniśmy “trzymać się z dala od Polski”. Jednak tu nie chodziło tylko o Polskę – brak równowagi rynku pracy niepokoił nas wszystkich, gdyż oddziaływał na całą mapę, nie tylko Polskę. Mimo to, przez większość czasu słyszeliśmy tylko punkt widzenia Radola na całą tę sprawę i nie mogliśmy porozmawiać z żadnym z jego mapperów. To było niezwykle frustrujące, że cała komunikacja musiała odbywać się przez jedną osobę, gdy chcieliśmy pomówić o tym problemie bezpośrednio z odpowiedzialnym za ten obszar mapperem. Jednak fakt że ta kwestia była uparcie odrzucana raz po raz, mimo zgody reszty zespołu że coś musi być zrobione by zredukować liczbę firm, nie wpływał dobrze na relacje zespołowe. Prędzej czy później, musiało to urosnąć do punktu, w którym jesteśmy teraz. Istota rozpadu leży w problemach wspomnianych w wyżej wymienionych akapitach: różnice twórcze, komunikacja i izolacja. Nagromadzone napięcie wywołało nieprzyjemną sytuację, która stała się w przyszłym tygodniu. Przez kilka miesięcy próbowaliśmy osiągnąć zbliżenie naszych celów. Pomogliśmy zespołowi PR, tworząc dla nich wiele zasobów, takich jak lampy, szablony dróg i prefaby. Daliśmy im wszystkie narzędzie, których potrzebowali by przejść na wyższy poziom – niestety, wszystko na próżno. W poprzednim tygodniu, Radol postawił ultimatum, z warunkami niepodlegającymi negocjacjom dla nas jak ProMods i zagroził że zakończy współpracę. Po krótkim badaniu opinii w zespole, jednogłośnie uznaliśmy że dla większego dobra w istocie lepiej rozwiązać współpracę. Decyzja by każdy poszedł swoją ścieżką była wzajemna – Radol, w imieniu całego zespołu PR, zdecydował się opuścić ProMods. Zatem, oczywistym pytaniem jest: Co teraz stanie się z Polską? Będziemy kontynuować pracę nad nią ale musi to być zrobione przez innych ludzi z naszego zespołu. Możemy teraz zaaplikować nasz styl pracy w tej części mapy, jednak do tego celu musimy przekierować siłę roboczą z innych terenów. Z pewnością rozwój będzie trwał, z czy bez Poland Rebuilding. Mamy kilku miejscowych z Polski w naszym zespole – pomogą reszcie zespołu utrzymać autentyczny wygląd państwa. Możecie śledzić dalsze postępy nad naszą wersją Polski na naszym forum, jak zwykle. Z szacunku dla pracy zespołu PR, nie rozpowszechnimy ich niewydanej pracy bez wyraźnej zgody. Stąd, przyszłe wersje ProMods będą oparte w dużym stopniu na stanie, w jakim Polska była w ostatniej wspólnej wersji – 2.15. Słyszeliśmy z innych źródeł, że zespół PR będzie kontynuował ich pracę w Polsce i wyda ją jako osobną modyfikację (tak jak było przed naszym wspólnym przedsięwzięciem). Ryzyko braku kompatybilności lub zgodności leży teraz po ich stronie. Nie blokujemy jednak żadnej modyfikacji kompatybilności z ProMods, a RusMap jest tego dobrym przykładem. Winszujemy naszym polskim fanom wsparcia które nam okazali. Wiemy że jest was sporo i zamierzamy dostarczyć najlepszą możliwą wersję Polski w naszych przyszłych wydaniach. Chcielibyśmy podziękować Radolowi i jego zespołowi za ich wkład w tym czasie i życzymy jak najwięcej szczęścia w przyszłych przedsięwzięciach. 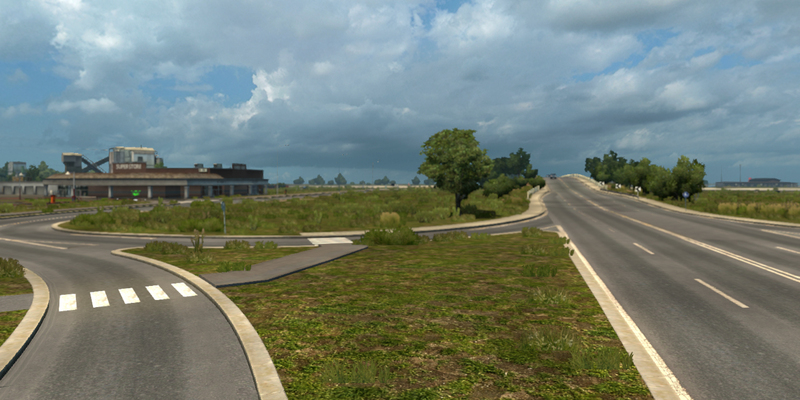 As you may have noticed while you were driving on ProMods 2.0, a large portion of Poland has been reconstructed. ProMods 2.0 marks a great milestone, since this is the first version where one of the most popular map addons, the Poland Rebuilding project, is fully integrated in the main ProMods map. 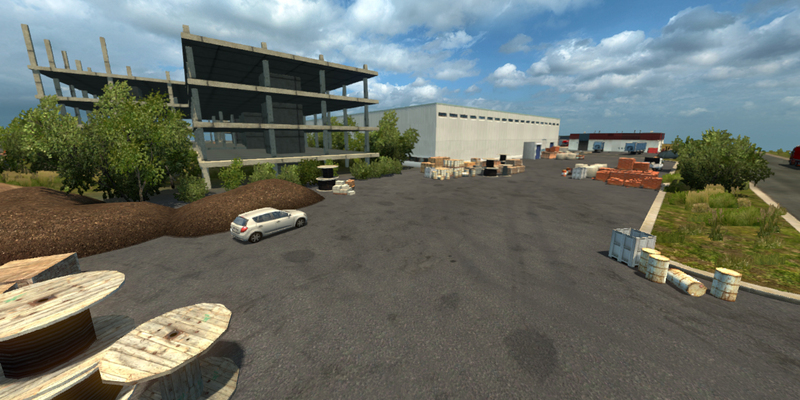 Unlike what most people outside the Polish Euro Truck Simulator 2 community think, this map project is not a one-man project, but has a whole team behind it. Today we want you to give you an impression what happens behind the scenes, who is in the development team, the project’s history, current work and future plans. First and foremost, we would like to highlight the excellent cooperation with other ProMods team members over the years, even in the time before the integration of the map. Both maps are meant to work complementary with each other, and their combined use was popular among the community. The full integration of both projects was only logical, and it was already planned to happen at some point. 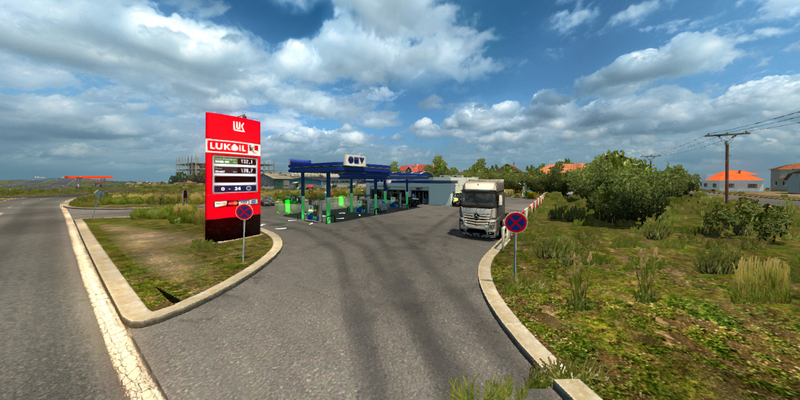 The Poland Rebuilding project – Initially named as Map of Home Rebuilding project – is one of the few Polish projects that survived the constant patching of Euro Truck Simulator 2 by SCS in the past 3 years. These patches often come with game engine or modding changes, which can cause compatibility issues with mods, which in turn causes frustration to the mod developers in order to keep their mods compatible with the latest version of Euro Truck Simulator 2. It all started with the Europe Rebuilding project by satan19990, to whom I would like to thank for starting this great adventure. It was at that time, I took my first steps in the editor, getting to know the tools and getting myself familiar with the rules of the game. At the same time I met another user called _PMA (I still remember this nickname quite well). It was hard working on the map, and despite all the major game changes and compatiblity issues, the Europe Rebuilding map still remained active. But this was not without struggles when updating the map to the new specifications. Due to all the problems, I even got near the point to shut down the project for a few times. Thankfully, I could still count on my friend _PMA to help me out and thanks to him I’ve learned a lot. At this point it was time for me to take over the leadership over this project under the name of ‘Poland Rebuilding’. I would like to introduce you to our Map Makers, the people who are the working force behind the map: Czaja, Desirae, GrakuPL and MirM (the tester). They are passionately putting all their effort in recreating familiar Polish sites you can see from behind the window of your truck. It is currently the best team with which I had the pleasure to work with. And let’s not forget about all the other people that helped us to a lesser extent, like modelers for example. Our current work focuses on the Northern and Central part of Poland. With a complete overhaul of i.e. the Gdynia/Gdańsk area, some parts will be a pinnacle within the Poland Rebuilding project and ProMods in its whole. We want to appease all our fans, eagerly waiting for new cities and areas. We work from throughout Poland one area at the time. We are planning to completely rebuild Poland entirely to our own liking, and whatever the map scale allows us to do. We did encounter a delay, due to work on the full integration of this Project into ProMods 2.0, which not only improves compatibility between the two, but also allows an even more comprehensive co-operation. We hope that this integration statisfied many players and other ProMods users who may not have tried Poland Rebuilding up to this point. I would like to thank my team and the ProMods Team for all the help and may this co-operation be beneficial for us all. I wish many kilometers of fun trucking to all the players.